This 2-Burner Propane Gas and Charcoal BBQ from Dyna-Glo will bring variety, performance and quality to your outdoor cooking repertoire. This unique grill offers dual fuel functionality, with 24,000 total BTU's over 952 sq. inch of total cooking space. It provides ample cooking space for large meals and the option to change up your routine by using charcoal or propane gas. The stainless-steel finish of the grill will bring style to your outdoor living space, along with convenient storage, as the collapsible side tables will save space when grill is not in use. To maximize your cooking precision, this grill features a double-wall lid to retain heat and a built-in, stainless thermometer with an easy-to-read gauge to help you tune the heat to the perfect temperature. Heavy-duty porcelain-enamelled cast iron cook grates retain heat to sear foods and lock in natural juices. This grill offers all the amenities you need to enjoy the classic BBQ experience. This durable KitchenAid<sup></sup> gas grill is built with premium corrosion resistant materials to provide years of cooking entertainment. The small footprint and foldable side shelves make it perfect for the griller with limited outdoor space while the heavy duty stainless steel wrapped cooking grates provide a surprisingly large cooking area. Its stainless steel burners and angled flame tamers reduce flare-ups and create Even-Heat<sup></sup> across the entire grilling surface. This durable KitchenAid Gas Grill is built with premium corrosion resistant materials and offers 644 sq. inch of total cooking space over stainless steel wrapped main cooking grids. The Even-Heat System with stainless steel burners, angled flame tamers and enhanced grates work together to distribute consistent heat across the entire grill surface and to reduce flare-ups. This grill is equipped with a 15,000 BTUs ceramic searing side burner that sears steaks to juicy perfection and helps craft the perfect outdoor meal. Want more. This KitchenAid grill can easily be converted to Natural Gas. Gather your family around the BBQ and ignite the flames. This 3-Burner gas BBQ, equipped with the exclusive GS4 grilling system, is the perfect excuse for a night-in with your favourite someone. The sleek-open cart design and side tables provides additional room and accessibility of your grilling tools thus creating a relaxing and hassle-free grilling experience. Dual Function 2-Burner Propane Gas and Charcoal BBQ in Black and Stainless Steel This 2-Burner Propane Gas and Charcoal BBQ from Dyna-Glo will bring variety, performance and quality to your outdoor cooking repertoire. This unique grill offers dual fuel functionality, with 24,000 total BTU's over 952 sq. inch of total cooking space. It provides ample cooking space for large meals and the option to change up your routine by using charcoal or propane gas. The stainless-steel finish of the grill will bring style to your outdoor living space, along with convenient storage, as the collapsible side tables will save space when grill is not in use. To maximize your cooking precision, this grill features a double-wall lid to retain heat and a built-in, stainless thermometer with an easy-to-read gauge to help you tune the heat to the perfect temperature. Heavy-duty porcelain-enamelled cast iron cook grates retain heat to sear foods and lock in natural juices. This grill offers all the amenities you need to enjoy the classic BBQ experience. 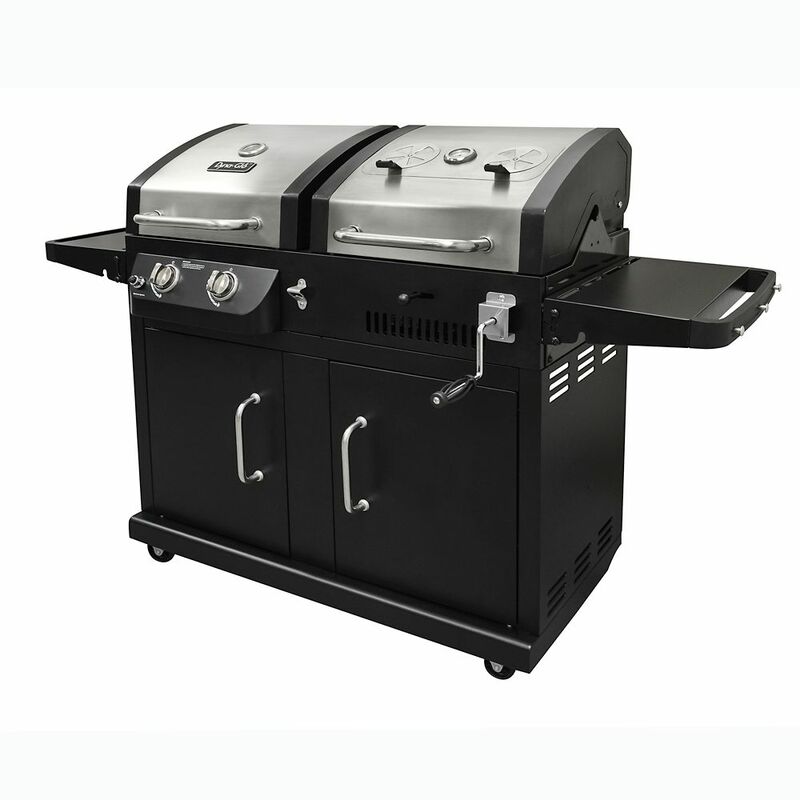 Dual Function 2-Burner Propane Gas and Charcoal BBQ in Black and Stainless Steel is rated 4.3 out of 5 by 52. Rated 4 out of 5 by Love from My husband had this put together on Christmas Day! ... My husband had this put together on Christmas Day! He grilled dinner, then lunch and dinner the following day ! He tends to be critical but thanked me for the grill several times. Must be a winner ! Didn’t give 5 stars since it’s so new. Hopefully it performs and holds up for a 5 star rating!! Rated 4 out of 5 by honeybees from Haven’t put it together yet. Delivery was earlier than expected,... Haven’t put it together yet. Delivery was earlier than expected, which was good. Delivery guys..when one watches you struggle to help move it, which is very heavy, and I’m a 63 yr old female, I thought how lazy! I guess the look I gave him didn’t give him the incentive to come over and help. Rated 5 out of 5 by Steven from SO far so good. My only complaint is the rotisserie... SO far so good. My only complaint is the rotisserie I purchased was not long enough to fit this grill. That should have been stated in the description of the product and I had to spend almost $50.00 to make extensions so it would fit. Rated 5 out of 5 by Carlos from Great dual grill. Good quality. ... Great dual grill. Good quality. Rated 5 out of 5 by Chuck from Awesome grill! Awesome grill! Can this be used with Natural gas? Can this be converted to natural gas or does it come in natural gas?